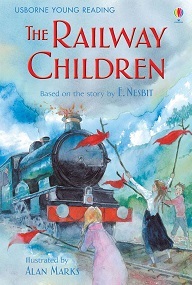 In Raising Steam, about 80% of the way in, a girl named Edith and her brothers intentionally block the railway so as to be able to save the train and be heroes. He had to stop there because the girl looked like death. And, if his instincts were right, somewhat damp around the legs, not weeping for effect this time but traumatized, her face white. He then says two things that seem clearly to be making a reference to someone real. He looked into her hopeful face and said, “I’ll square this with the engine driver, but if I was you I’d get my pencil and turn any clever ideas you have like this into a book or two. Those penny dreadfuls are all the rage in the railway bookshops. I hear there’s money in it, and you won’t meet Cedric that way. Oh, and don’t keep waving your pinafores at people. It could give quite the wrong idea in the dark. 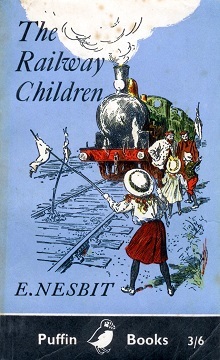 This refers to The Railway Children, by Edith Nesbit. “It's ALL coming down,” Peter tried to say, but he found there was hardly any voice to say it with. And, indeed, just as he spoke, the great rock, on the top of which the walking trees were, leaned slowly forward. The trees, ceasing to walk, stood still and shivered. Leaning with the rock, they seemed to hesitate a moment, and then rock and trees and grass and bushes, with a rushing sound, slipped right away from the face of the cutting and fell on the line with a blundering crash that could have been heard half a mile off. A cloud of dust rose up. “Let's run,” said Bobbie, and began. But Peter cried, “Come back!” and looked at Mother's watch. He was very prompt and businesslike, and his face looked whiter than they had ever seen it. “Oh, stop, stop, stop!” cried Bobbie. No one heard her. At least Peter and Phyllis didn't, for the oncoming rush of the train covered the sound of her voice with a mountain of sound. 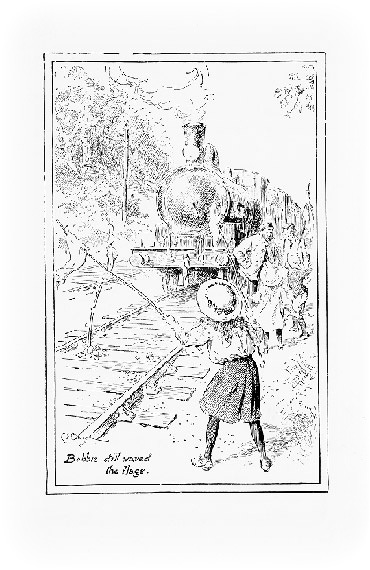 But afterwards she used to wonder whether the engine itself had not heard her. It seemed almost as though it had—for it slackened swiftly, slackened and stopped, not twenty yards from the place where Bobbie's two flags waved over the line. She saw the great black engine stop dead, but somehow she could not stop waving the flags. 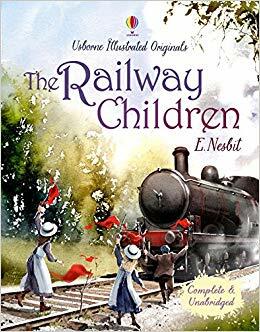 And when the driver and the fireman had got off the engine and Peter and Phyllis had gone to meet them and pour out their excited tale of the awful mound just round the corner, Bobbie still waved the flags but more and more feebly and jerkily. 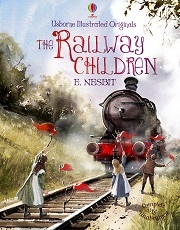 The joke seems to be that "Edith" in Raising Steam grows up to be a famous writer (hence "grateful for her imagination") and turns the idea of blocking a train (by "waving your pinafores", even) into a chapter in what's probably the best-known Nesbit novel. What are the names of all the named characters who appear in the Discworld novels in order of appearance?